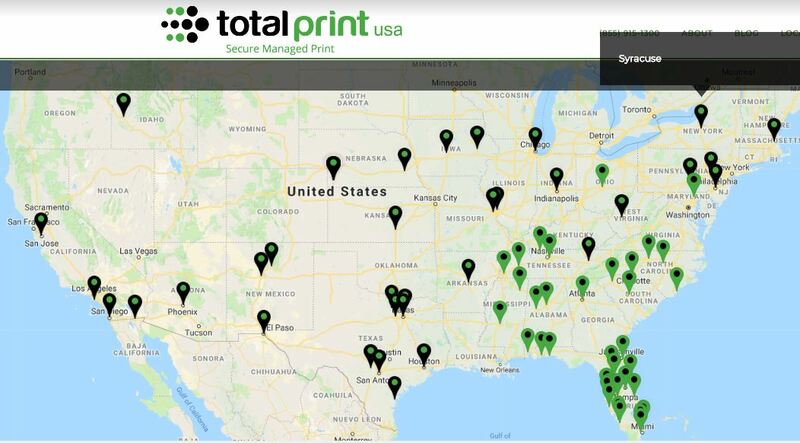 TotalPrint USA has added the locations of our managed print service offices to better inform our customers of our service footprint. TotalPrint USA has 29 offices and over 60 satellite operations. Each one of these offices allow us to service customers within a 200 mile radius, leading to minimal down time. From here we are able to provide on site service for our HP managed print services offering. We are also able to service other leading manufacturers from these locations. TotalPrint USA is a nationwide company with the unique ability to implement managed print services anywhere in the US. TotalPrint USA’s size and buying power provide the ability to service different areas including everything from all major metropolitan areas to the most rural of places. Even in areas we don't have operations, we can achieve service through partnership, acquisition, or full time employment. That way, everyone nationwide, can take advantage of our cost savings through our managed print services program.